The primary purpose of this article was to review the next-generation lipid-lowering therapies that are under current development and clinical testing. We reviewed the mechanism of action of these drugs and how they act on different pathways of lipid metabolism. Additionally, we aimed to present data from clinical trials evaluating clinical outcomes, efficacy, and safety of these novel agents. Lastly, we sought to provide recommendations for clinical practice and to comment on the cost-benefit analyses of such drugs. We evaluated the following lipid-lowering agents as they pertain to secondary prevention of atherosclerotic cardiovascular disease (ASCVD): ezetimibe, proprotein convertase subtilisin/kexin (PCSK) type 9 inhibitors, cholesteryl ester transfer protein inhibitors, and eicosapentaenoic acid ethyl ester. The two novel therapies currently approved by the US Food and Drug Administration and endorsed by the latest ACC/AHA cholesterol guidelines include ezetimibe and PCSK9 inhibitors. Although other drug classes have shown promising preliminary results, clinical trials evaluating cardiovascular outcomes are ongoing. Patients with known ASCVD are at risk for recurrent ischemic events. Lipid-lowering therapies are an integral part of secondary prevention measures in such patients. There has been an upsurge in development of newer generation lipid-lowering therapies which have shown excellent results in preclinical studies. When added to statin therapy in high-risk patients or patients with suboptimal lipid profile despite statin therapy, these agents may significantly lower recurrent adverse cardiovascular events. Thorough cost-effectiveness simulations need to be performed prior to introduction of these agents in routine clinical practice. Dr. Dhruv Mahtta and Dr. Anthony A. Bavry declare that they have no conflict of interest. Dr. Salim S. Virani: research support: VA Health Services Research and Development, American Heart Association, American Diabetes Association, and research fund from Drs. Abida and Nuruddin Jooma. Dr. Virani also serves on the steering committee for the Patient and Provider Assessment of Lipid Management (PALM) registry at the Duke Clinical Research Institute (DCRI) (no financial remuneration). •• Grundy SM, Stone NJ, Bailey AL, et al. 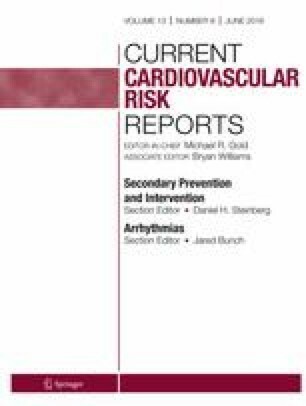 AHA/ACC/AACVPR/AAPA/ABC/ACPM/ADA/AGS/APhA/ASPC/NLA/PCNA guideline on the management of blood cholesterol: a report of the American College of Cardiology/American Heart Association Task Force on Clinical Practice Guidelines. J Am Coll Cardiol. 2018, 2018. https://doi.org/10.1016/j.jacc.2018.11.003 This is the most recent 2018 ACC/AHA cholesterol guidelines.